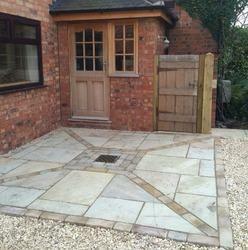 We offer a stunning variety of sandstone suitable for domestic and commercial use. Owing to their natural beauty, these natural sandstones from India are used for interior as well as exterior decoration including flooring, paving, wall cladding, etc. 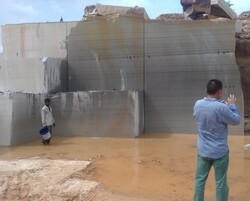 The weather resistant natural sandstones are extremely hard and tough material. Available in different finishes, our range of natural sandstones from India can be cut to the size required by the customers. The array includes Grey Sandstones, Kandla Grey Sandstones, Dholpur Red, Marson Copper, Rajpura Green, Dholpur Pink etc. Rajgreen Sandstone popularly known as Rajpura Green is an excellent building stone. Rajpura stone can be chiseled and dressed to a smooth surface in various attractive shapes and has a variety of uses such as roofing, flooring, paving and paneling. Dholpur Sandstone is very popular in Indian market for interior as well as exterior wall cladding. Dholpur Sandstone is available with various colors like Dholpur Beige, Dholpur white, Dholpur pink and Dholpur red etc. 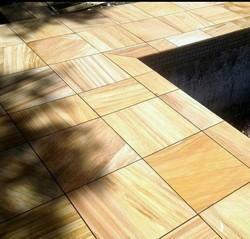 Dholpur Sandstone are available with various forms like tiles, slabs, strips. 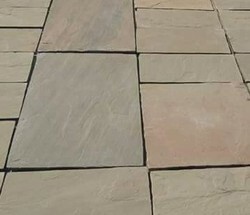 Dholpur Sandstone could be use for Outdoor flooring. Teakwood Sandstone are very popular for Outdoor flooring and indoor flooring as well as exterior and interior wall cladding. Teakwood Sandstone have waves and texture on it. Acid proof mandana red sandstone is very popular for chemical factories. 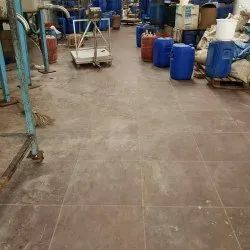 Mandana red sandstone is only and best option for flooring of any new setup of chemical plants. Because of its acid free quality mandana red sandstone is highly demanded for Dairy products as well as chemical factories. Black Sandstone is also known as Sagar Black Sandstone. Sagar Black Sandstone is highly recommended by architects and landscapers for Wall cladding as well as outdoor flooring and Paving applications. We provide black Sandstone with various finishes as per customers choices. After finishing black Sandstone could be used for interior wall and flooring also. Flagstone Create an exterior living area with irregular Flagstone paving. Let the unique colors and patterns transform your patio into the family room outside. It gives ancient European look for the outdoor area of any hotel, home and resort. 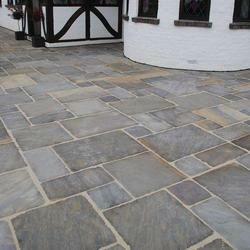 We supply these flagstones at very reasonable price in Indian Market. Flagstones are available with various colors like, Grey, Olive Green, Brown, and Mix colors. We also provide the installation facility for Indian Customers. Panther Sandstone is the best option for larger housing projects because of its cost effective features and natural burgundy colors. 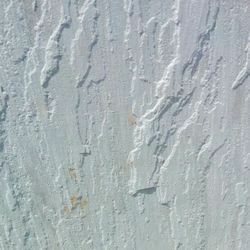 Panther Sandstone could be use for Wall cladding as well as outdoor flooring, indoor flooring and pool coping. 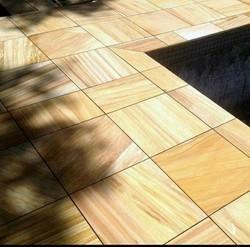 Teak Sandstone is well known for Indoor and outdoor flooring, wall cladding. Teak Sandstone has it's natural wood look features. Teak Sandstone is available with various sizes and finishes as per customers requirements. Kandla Grey Sandstone or more popularly known as Kandla Grey is a kind of sandstone in which the quartz grains are cemented together by secondary silica calcite. The presence of minor color tonal variations make it a unique and attractive building stone. Because of three different origins within Bhilwara district, this sandstone comes in three different shades of bluish grey, dark grey and light grey. 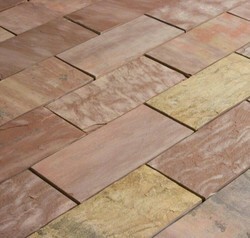 We are leading manufacturer and supplier of Mandana Red Sandstone Tiles. Red sandstone are also known as mandana red sandstone. 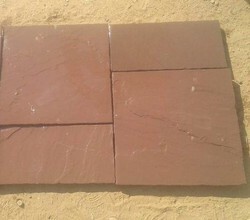 Red sandstone are used as Paving, flooring, wall cladding, and landscaping. 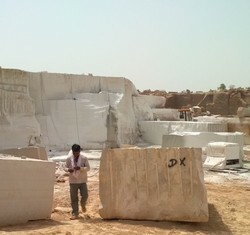 We are leading manufacturer and supplier White Sandstone from India. White Sandstone are available at wholesale prices with customised sizes and finishes. White Sandstone are available with various forms like, White sandstone cobbles, White Sandstone Paving Tiles, White Sandstone Paving Slabs, White Sandstone Circle, White Sandstone flooring, White Sandstone Slabs, White Sandstone Walling, white Sandstone Bricks etc. Because of its quartzite property mandana red sandstone is 100% acid proof. Acid Proof Mandana Red Sandstone are highly demanded in chemical industry, dairy industry etc, for flooring and wall cladding purpose. We offers various finishes and sizes in Mandana red sandstone according to customer's damand. 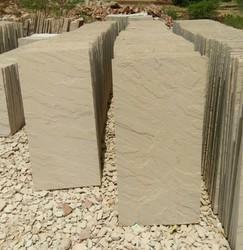 We are leading quarry owner and supploer of Kandla Grey Sandstone Rough Block from Bijolia, Bhilwara, Rajasthan. We provide various types of sandstone blocks with different sizes at very competitive prices. Our Blocks could be cut and dressed by single Block cutter and Gangsaws.